It's great when IHSW co-incides with a double Bank Holiday Weekend AND you don't have to work at all. So I got plenty done on all four days this month. I had already stitched a length of brown when I realised I hadn't taken a starting photo. We now have a fish and the whole of the Counterweight Continent done except for the backstitch. The entire continent is governed by the Agatean Empire, whose capital city is Hunghung. Geographers and philosophers had long inferred the existence of such a continent, as in order to make the Discworld "work" , it was taken as given that there must be a more-or-less equal weight on the shoulders of all four elephants. Otherwise things would get distinctly unbalanced and the floor might start to tilt underfoot, with unforeseeable and possibly dire consequences. (This prospect also engages the minds of the Balancing Monks, who travel around the Discworld leaving judiciously located small weights behind them wherever they travel, so as to keep things in balance). Great excitement as I also had a new start this weekend. Last year I was stitching-along with Linda on Mrs Peggotty's Alice and the Flamingo. 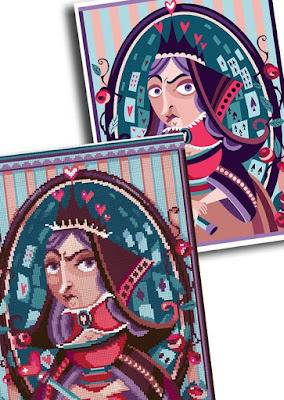 Linda was very keen to stitch another design this year and we chose The Queen of Hearts. She will be my "bath-time" project for the rest of the year. For new followers, this is NOT a project I stitch in the bath, but one I stitch while my son is in the bath and I watch him to ensure neither he nor the bathroom drown. When I printed out the chart for the Queen, it became obvious she is smaller than Alice. Which seems strange. So, in order for them to appear more similar I have chosen to stitch her on 22 count hardanger rather than 25 count evenweave. 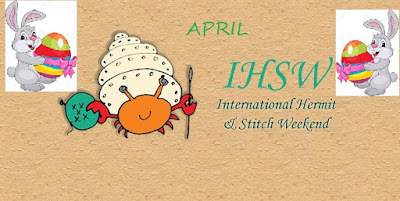 The next IHSW will be 17th - 19th May so make sure you note the date in your diary or come and join us in the Facebook Group - IHSW on Facebook. If you don't do Facebook then you can check in here. Finally, thank you to everyone who took part in the Easter Treasure Hunt Blog Hop and everyone who has hopped around to visit the blog and guess the mystery phrase. All the links go direct to the posts now so you have plenty of time to try and guess the phrase. Happy Hopping! 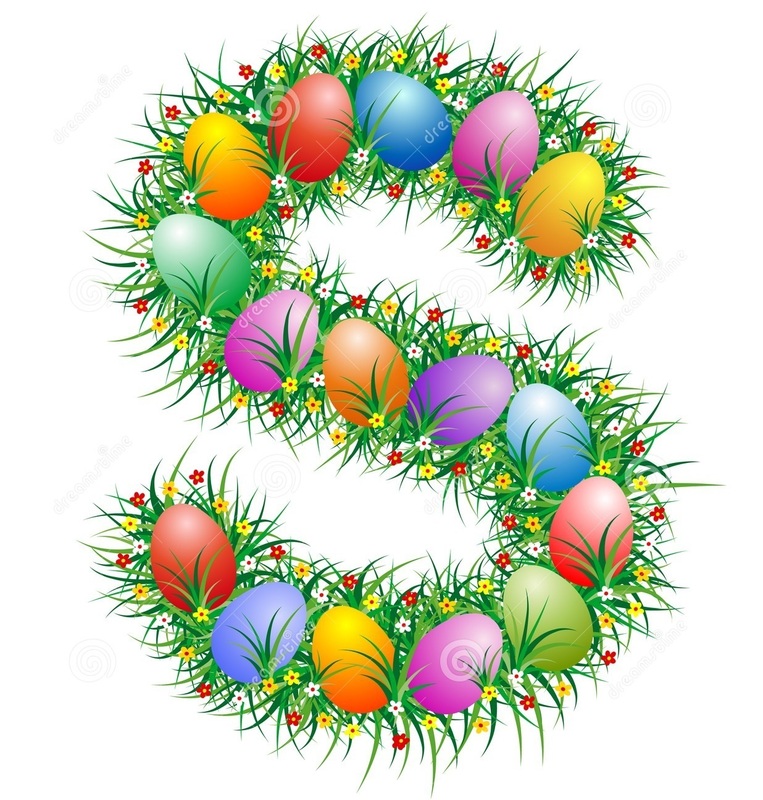 Welcome to this year's Easter Treasure Hunt Blog Hop; the bounciest, springiest Hop of them all! 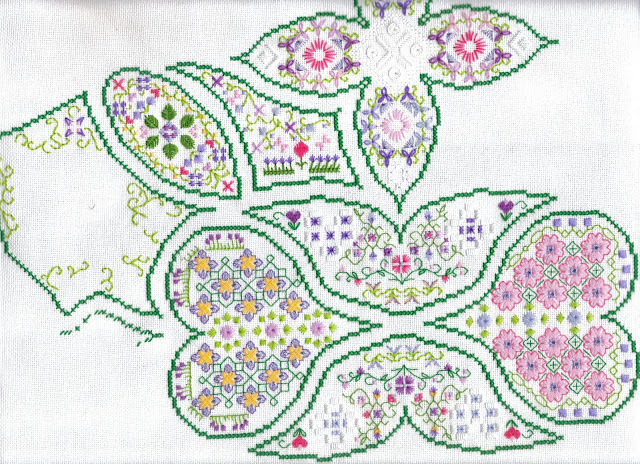 The original kit was fully beaded on perforated paper but as the chart for this was passed on to me without the supplies I used a piece of 16 count yellow aida and the DMC equivalents to stitch this. I needed a small project for my train journey last week and this was perfect. As usual, I have a list of bloggers, each one was allocated a letter which will spell out the mystery phrase when you hop round in the order below. A little clue this year - you may be confused to start with as the letters may not seem to spell out anything you can understand but persevere and all will become clear! Hopefully you have a phrase now! Don't forget that some people will post later than others because of time zones. Leave a comment telling me what you think the mystery phrase is. I have enabled comment moderation so the answers will not appear for two weeks. Closing date is Friday 3rd May, 2019. My second finish was a new start last Easter so it is very fitting that it was finished for this Easter. A lovely bright Springy design from Satsuma Street officially called Nest Egg but also referred to as "Goose in a Bonnet" as a nod to the 80s when I did not stitch those sorts of designs! I bought a felt basket from The Works and cut it apart to get a nice long line of "grass" which I stuck to the edge of the frame. Then I "planted" the Mill Hill Egg in the grass! Because the frame is a box frame, the trim doesn't obscure the stitching. Finally, it is IHSW - International Hop & Stitch Weekend - or Hermit, whichever you prefer! 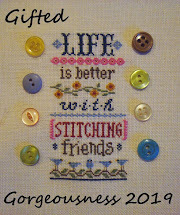 Enjoy the Blog Hop and make time for stitching inbetween the egg hunting! Have a wonderful weekend. Except for Alicia, the Crafty Princess who is working all weekend. Hope it's a quiet and peaceful weekend instead! Welcome to the April Gifted Gorgeousness link-up. The link-up date continues to be the 15th and I will keep the link-up open until the end of each month so you have plenty of time if you are late posting. 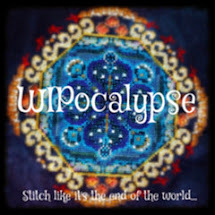 That will be a banner and a pointing hand once it has been backstitched. I also worked on this small, which once again I am saving for the Blog Hop. This Mill Hill Daffodil Egg was a gift from Riona. Finally, I hope everyone who wants to take part in the Easter Blog Hop has now sent me an email and received confirmation that I have added them to the list. I will be sending the emails out on Wednesday with your letter from the Mystery Phrase and further instructions. The Hop itself will take place on Good Friday 19th April which is also the first day of International Hermit & Stitch Weekend. Perfect timing! Not such a flurry of fully finished objects this month I'm afraid. I planned to do a batch on Sunday afternoon (my favourite time to fully-finish) and then a local group invited us to a gym party. Two hours FREE gym for my son when it usually costs £5 for one hour? Yes please! But I did manage to finish my March Christmas Ornament into a little bell-pull style finish. This is The Sweetheart Tree Christmas Noel Bellpull from the Just Cross Stitch Christmas Ornament Special 2007. I cut some batting to shape, laced the back of the linen and then whip stitched a piece of dark green felt to the back. Added a tassel made from co-ordinating thread and a little hanger from a piece of ribbon in my stash. 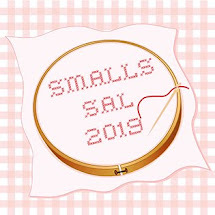 I have remembered to save some of the ribbon for the other two in this series which I will be stitching later this year. That was the only thing I FFO'd this month. So here are a couple of other designs finished in a similar way. 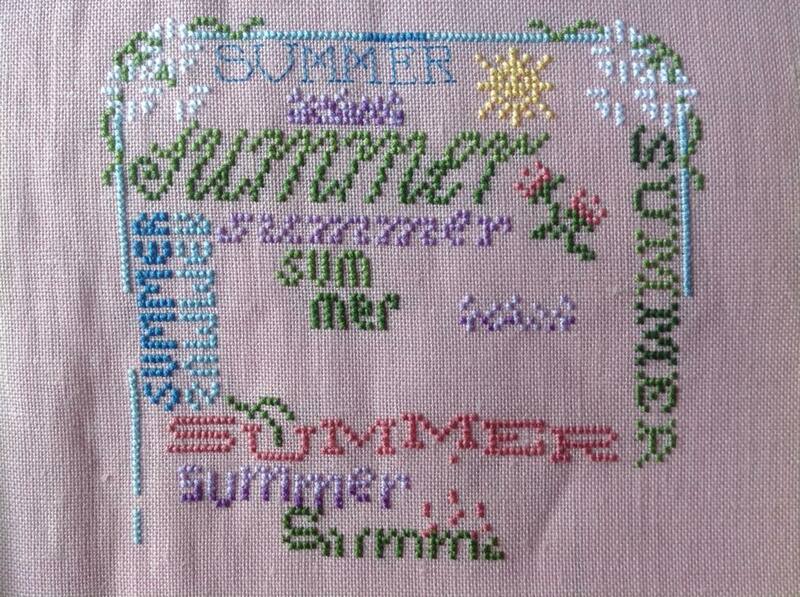 Don't forget to hop over to Rachel's blog and see what everyone else has Fully Finished this month. Finally, I will be hosting my Annual Easter Treasure Hunt on Good Friday the 19th April. 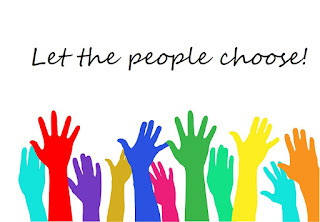 If you would like to take part this year, just leave a comment here. 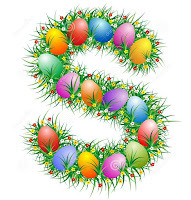 The week before Easter I will send you a letter of the alphabet which will form part of the mystery phrase. On Good Friday you will post that letter along with a photo of something seasonal that you have stitched (could be Easter or Spring or just something cheerful and sunny or floral). We all hop around like little bunnies to find the Mystery Phrase! It's my 8th Blogaversary today! Where has the time gone? That's me when I was 8. Once again you can just see my little brother to my right wearing pink and green. 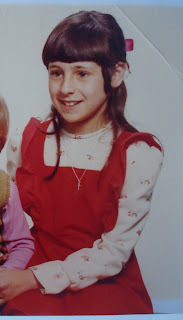 That was a very fetching mustard and green knitted tanktop, My little sister was at the other end wearing a brown/orange toned dress with a blue ribbon trim. In the 1970s it was All The Colours For All The Children. None of this pink/blue nonsense we have now. We'd had a fairly stable homelife that year. I moved into the Juniors at School and Mrs Butler's class. I actually saw her earlier this year and recognised her so it was nice to let her know what an influence she had been. I read my first Charles Dicken's story in her class - A Christmas Carol. How has the blog done over the past year? Readership has held steady, my pageviews have increased but comments have decreased. I suspect that this is connected to the way people read blogs now. It's much harder to comment using a mobile device. If you are a regular silent follower, why not make this post your first comment? It would be amazing to push those comments to 20,000 by this time next year! Yes, I burst through the 1,000,000 mark this week! What have I been working on recently? 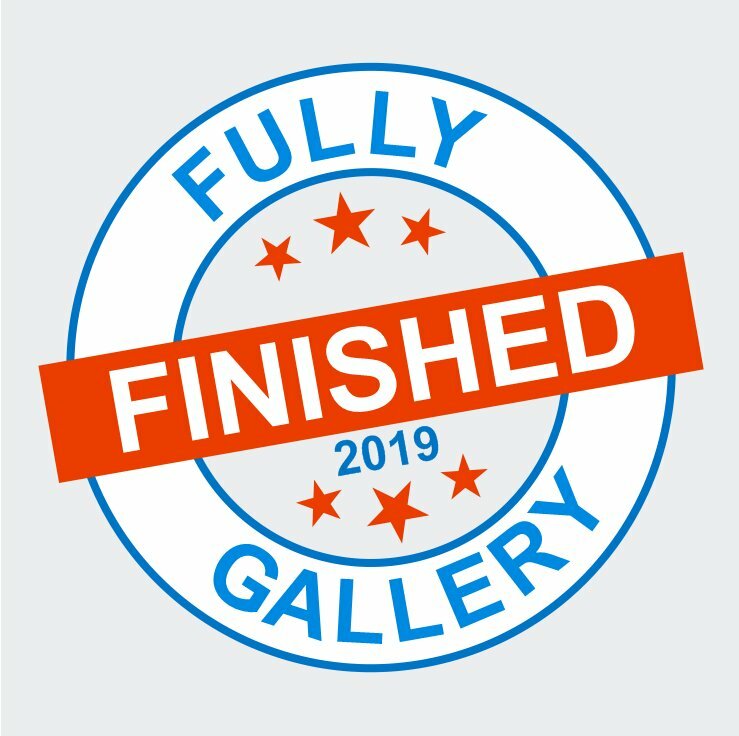 I had a quick look back at last year's Blogaversary post and all the pieces there have been finished which is encouraging. This is a Dragon Dreams design and the fabric is actually Reed Green not grey. Having worked on my Christmas and Hallowe'en pieces for 3 days each, this is where I would usually pick up my Chatelaine but I decided to do something different this month and work on another of my "19 in '19" choices. As we are close to Easter I chose Gathering Eggs by Nora Corbett. The first picture is with my TUSAL jar so I can link up with Daffycat for this month. I worked hard on her hair and face for two days. The frog had attacked her last year so it was nice to get this part finished. Lots of different colours and blended threads too. Hasn't she got a sweet face? Last year I asked you all what was your favourite blogging or stitching moment of the last year so it seems like a good idea to revisit that question this year. Leave a comment and let me know. A new blogging year also seems like a good opportunity to launch a new blog. I've been showing my painted rocks recently and everyone seems to enjoy seeing them so I thought I would start a specific rock blog - Serendipity Rocks UK. 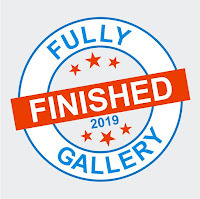 It's still a work in progress, I'll be adding posts over the next two weeks so make sure you follow using a Reader so you see them all, or just pop back from time to time. I decided on a blog rather than Instagram or Facebook because I can add Labels to the posts and find specific themes if I want to. March was a good stitching month, I hit all my targets and reached all my goals. I am probably going to have to rework my rotation to fit in some of the other projects on my 19 in '19 list. 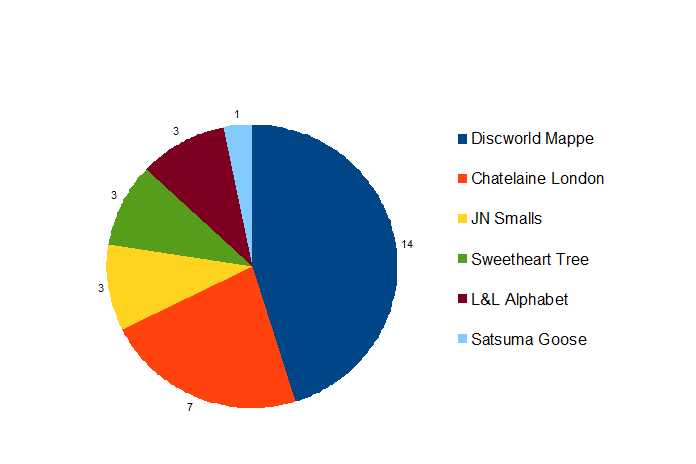 The original plan was 7 days on my Chatelaine and 14 on the Discworld Mappe. Leaving 7 - 10 days per month for everything else. Which would be great if I didn't have to work full days most weeks. Even one full day per week knocks my stitching days down. I usually manage to do 30 minutes on a Just Nan small but that's it. So next month I am going to choose a different project instead of the Chatelaine and see how that works. Of course I did spend 3 days stitching the moon on my Enchanted Alphabet. Maybe the bats will be quicker this month? I stitched all the words on the crest, all of XXXX next to the crest, moved across to the Counterweight Continent on the left and stitched a lot of the red/white border as well as its backstitch. 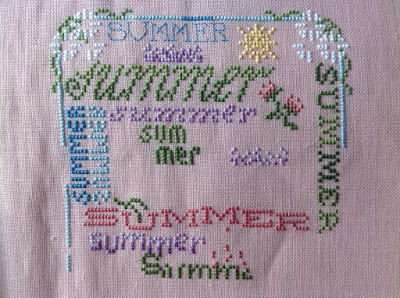 Once I have filled that in and done the backstitch lettering and features I will move the left and start on the next directional arrow. I did buy a few bits and pieces this month but none of it actually counts against my Stitch From Stash budget. Magazine Subscriptions are exempt, as are finishing materials (the charms) and of course Mr. Linky is a blog-purchase not a stitching item. March – What newer designers and product creators (fabric or floss dyeing, etc) out there have you discovered and recommend?